It has been a fairly long time since I have been on and had fun benching an AMD setup. So looking at the huge interest amongst techies in present generation Phenom II processors, I guess spending some time with a Phenom II setup was inevitable. Now I need a good platform to unleash all that latent potential. In comes the Gigabyte MA790FXT-UD5P, muchos gracias Gigabyte. 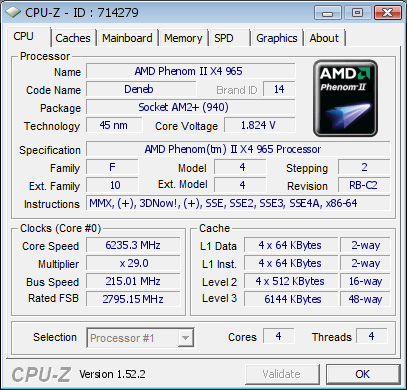 So I have a Phenom II X4 965 BE and I am feeling nice - thank you very much AMD. Unbeatable multi-core value with AMD Phenom™ II processors. They deliver The Ultimate Visual Experience™ for high definition entertainment, advanced multitasking performance, and power-saving innovations for smaller, cooler machines that are energy efficient. Live your life in HD. AMD Phenom™ II is for high definition entertainment, gaming, creativity, and beyond. With AMD Phenom™ II processors as the foundation, you'll enjoy a new level of responsiveness and visual intensity. AMD puts high definition computing within everyone’s reach. Superior technologies for HD video. Enjoy a superior high definition experience for HD videos on you PC. AMD Phenom™ II processor are the powerful engine behind your fidelity, high definition video entertainment experience. Only AMD puts the Ultimate Visual Experience™ for HD video within your reach. Perfect chemistry. Combine AMD Phenom™ II processors and ATI Radeon™ HD graphics to really see the difference. Enjoy smooth video, brilliant videos and immersive games. AMD unleashes visual clarity and responsiveness for what you want to do. Do it all. AMD Phenom™ II processors have the power to do it all. Featuring next-generation quad-core design, they crush even the most demanding tasks. So design it, render it, play it, create it, stream it, HD it. * With AMD Phenom™ II processors, if you can imagine it, you can do it. Make a choice you can feel good about. AMD Phenom™ II processors were designed with energy efficiency in mind. Capitalizing on AMD's leadership in energy efficiency, they incorporate all of the latest technology that gives you performance when you need it and save power when you don’t. Look for ENERGY STAR® with AMD. Thanks to AMD's power-saving innovations, you can count on machines based on AMD Phenom™ II processors for the energy efficiency you want and the performance you need. But techies/geeks/nerds, technology enthusiasts in short, are a hard bunch to please. They have to have a hands-on experience before they form an opinion or pass a judgment. Those who have owned and maybe lived their Gigabyte motherboards, especially the top-of-the-line models, will know that these things mean serious business right out of the box. The board is the same, top quality stuff that I have been witnessing since the past few years. Ultra Durable 3 Technology with 2oz copper cooled quality, ferrite core choke, Japanese solid capacitors for lower working temperature, improved energy efficiency and enhanced stability for overclocking. 10 SATA 3GB/s ports and RAID. OS MS Windows XP and Vista. 3Dmark06 tests your system's DirectX 9 performance. 3Dmark Vantage tests your system's DirectX 10 performance. As you can see, the graphics card is the bottleneck here. A hit or miss with gamers, Far Cry 2 still stands as one of the decent games to test the gaming performance of one's system. MAXON CINEBENCH runs several tests on your computer to measure the performance of the main processor and the graphics card under real-world circumstances. The following results were obtained with a Thermalright Ultra120 Extreme cpu cooler, coupled with an Antec 120mm 78cfm 2000rpm fan. To extract a little more, something we all crave for, the GPU was overclocked to higher than stock speeds. Anything higher than this on CPU and it will not allow to complete the benchmark run. As indicated by the huge excitement generated around the Phenom II line-up of processors, the X4 965 Black Edition being the premium flag bearer it surely does not disappoint. The processor is fast enough for most daily computing needs at stock speed and has a fair enough overclocking headroom. Thanks to the unlocked multipliers which make it a breeze to run it at higher than stock speed. There is a marked improvement in performance over the previous generations. Considering the combined prices of a retail 965 processor and a top notch motherboard (to extract the maximum), the AMD platform still falls behind in overall performance compared to an Intel Core i7 system selling at an almost similar price point. Last but not the least, AMD is slowly but steadily trying to reach the performance levels set by the new generation Intel processors. What's become the norm for Gigabyte motherboards continues with the 790FXT. The board reeks quality from every slot to SMD. The new heatpipe cooling system has a distinctly neat look and finish and the board has all the features typical of boards boasting the Ultra Durable 3 technology. Not once did the board even seemingly falter when put through it's paces. Anyone going the AM3 way should definitely consider the Gigabyte MA790FXT-UD5P before finalising their shopping list. This boards gets my vote as one of the best boards out there for the AM3 platform.